Acrylic handles. 8" centers. 1/2" IPS connections. Washerless cartridge. Accepts Delta repair parts. Uses cartridge #163420. Patented, self-aligning plunger stop with non- rotating tip eliminates the grinding action that causes washer wear in ordinary faucets causing drips and leaks. No corrosion, because Celon underbody is non-adhesive, so water minerals will not stick. Simple to install, because each faucet is packaged with hand-tight lock-nut connections and an ABS putty plate; built-in handle stops prevent overtightening. Single metal lever handle. Reliable washerless cartridge. Provides CEC-compliant flow rate of 1.8 GPM. Includes black, plastic side spray with 48" Snap-Connect spray hose. Suitable for 4-hole installations (adjustable 6" or 8" on-center). 1/2" MIP copper supply tubes. Certified lead-free. 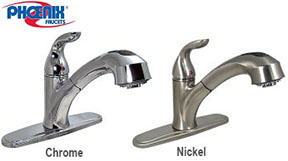 Pull out kitchen faucet with detachable deck plate for 1 or 3 hole installation. Includes stainless steel retractable hose. 3 Hole or single hole. 56" Hose. Stream or spray button. Ceramic disk cartridge for years of operation. 8" Centers. 1/2" IPS connections. Ceramic cartridge. Non-metallic waterways. High Arc, 1/4 Turn washerless cartridge. Phoenix. Teapot handles. 8" centers. 1/2" IPS connection. Washerless cartridge. Nonmetallic waterways.